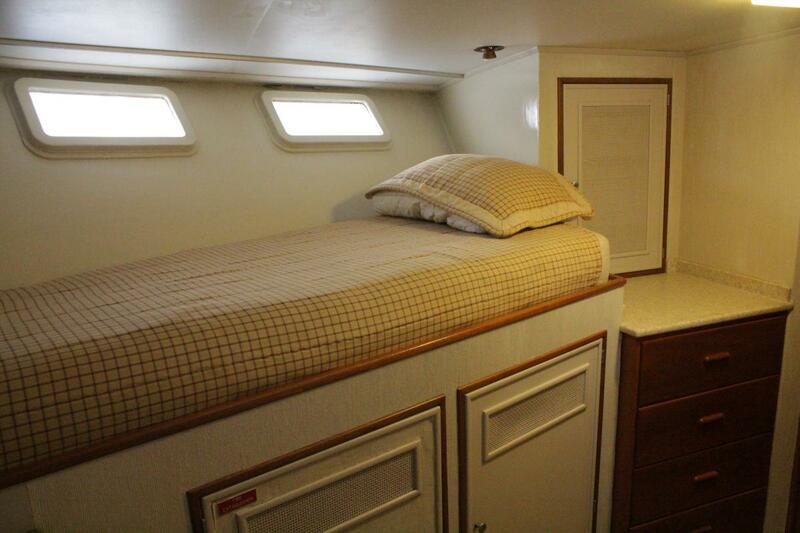 Accommodations for 6 in 3 staterooms, plus 3 crew (or guests) in 4th stateroom. 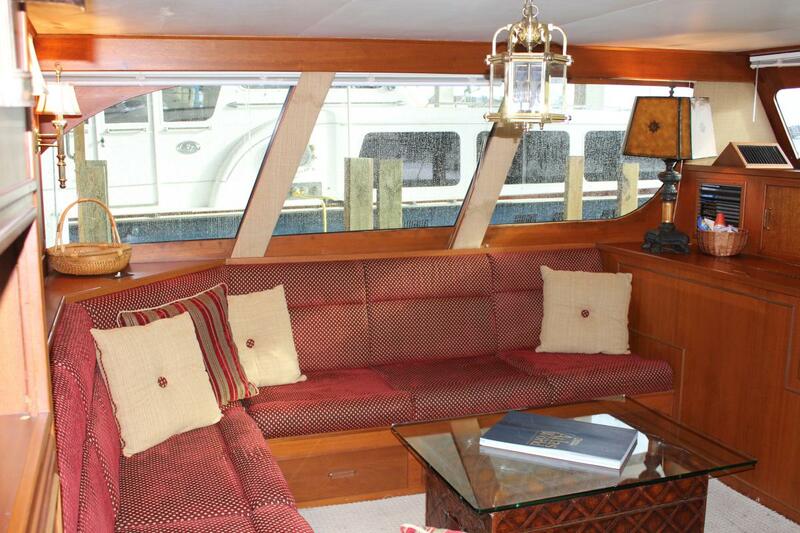 Forward of the salon are two guest staterooms, with the crew cabin all the way forward. 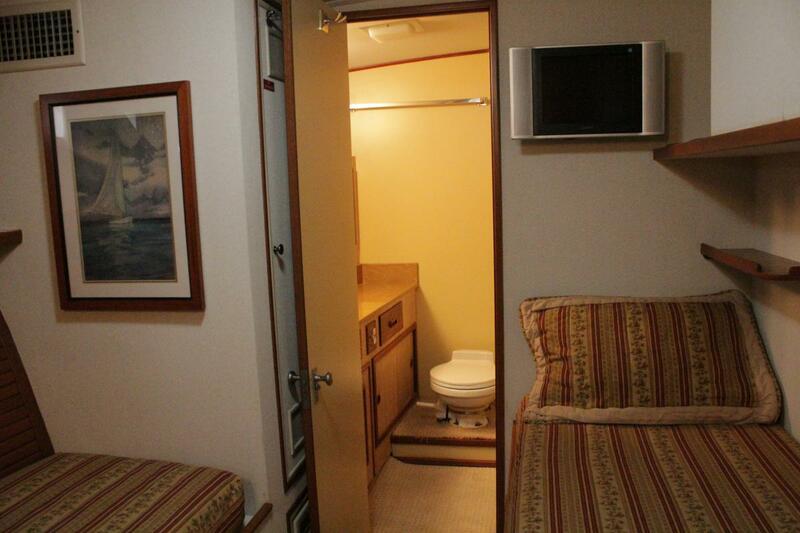 The crew cabin has a private head. 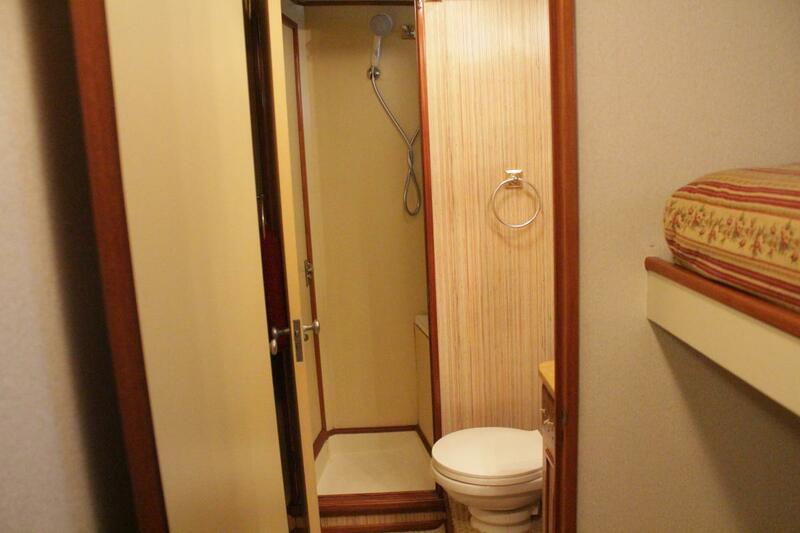 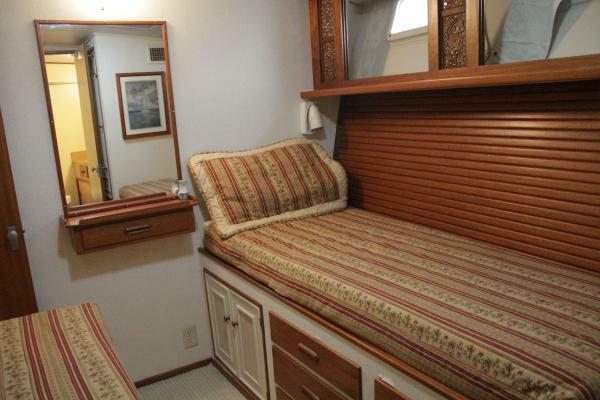 One guest cabin features side by side lower berths, with a private head and shower. The second guest stateroom has an upper/lower berth arrangement with a private head with double access to companionway for guests. 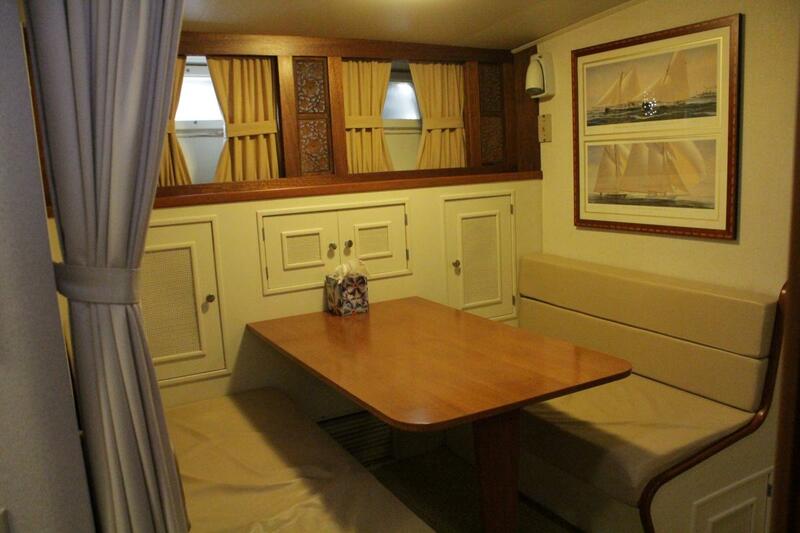 Each stateroom has a flat screen TV. 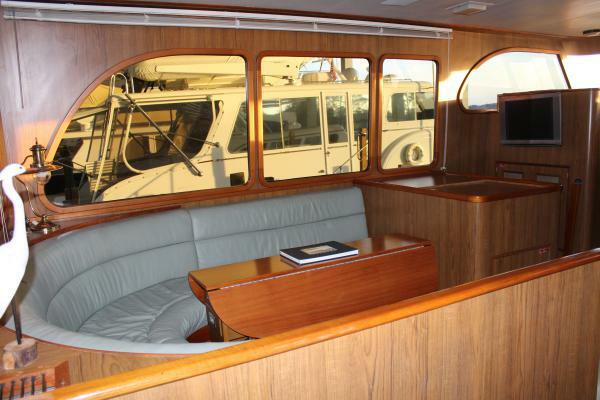 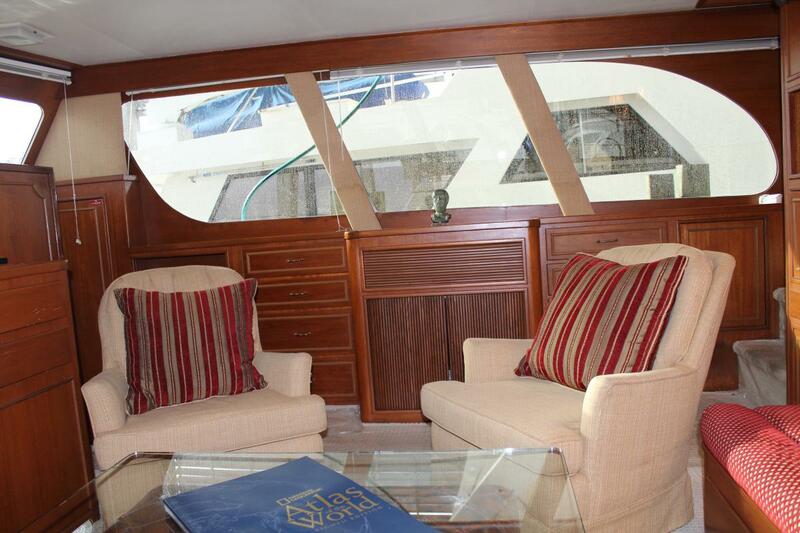 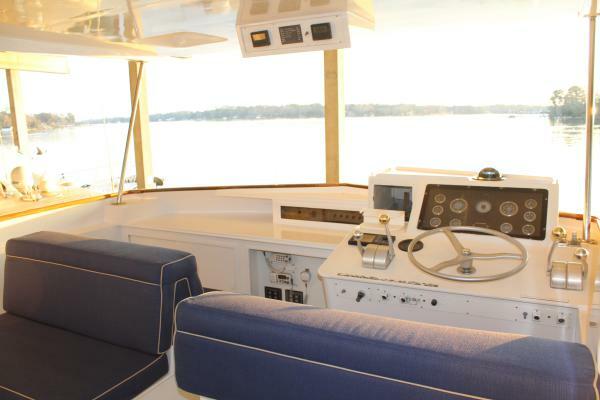 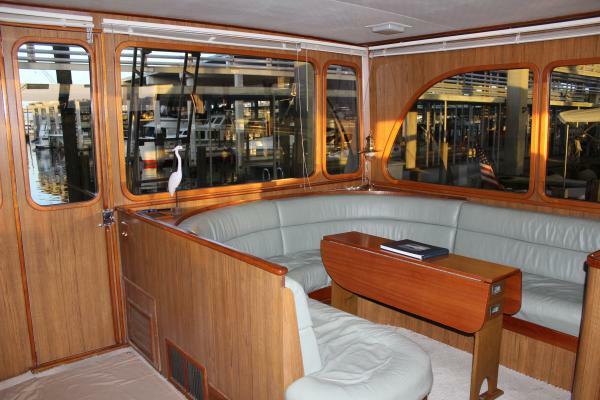 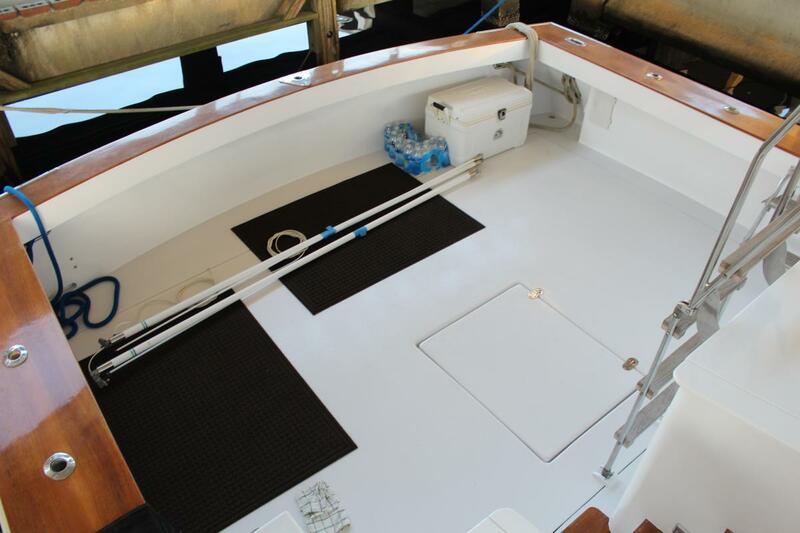 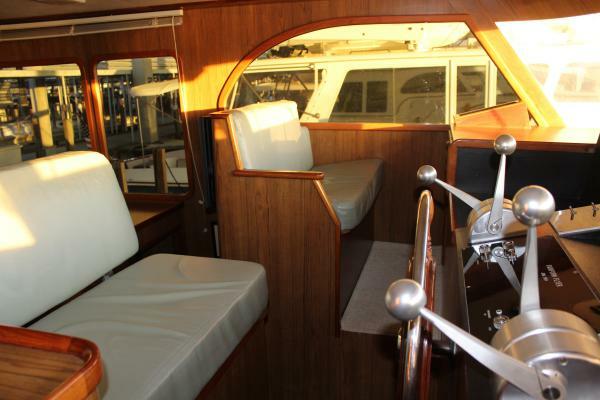 The galley is located in the aft section of this area, with a dinette with seating for 6. 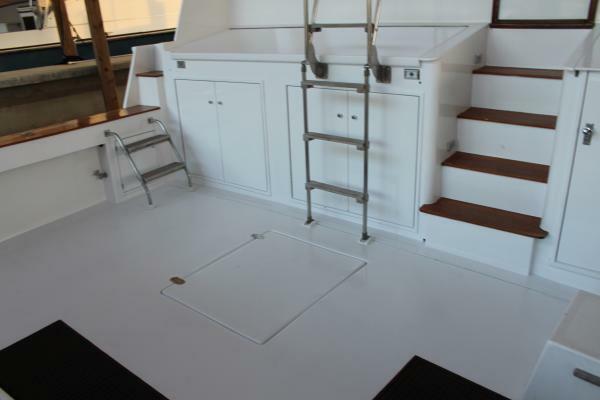 Teak and holly cabin soles, plenty of cabinet storage and cream Corian counters. 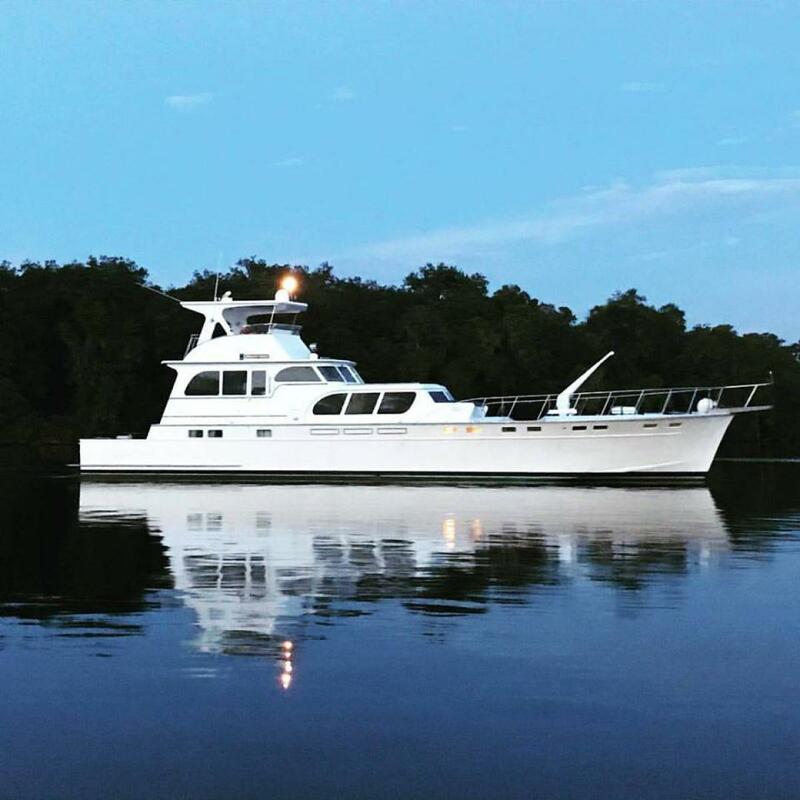 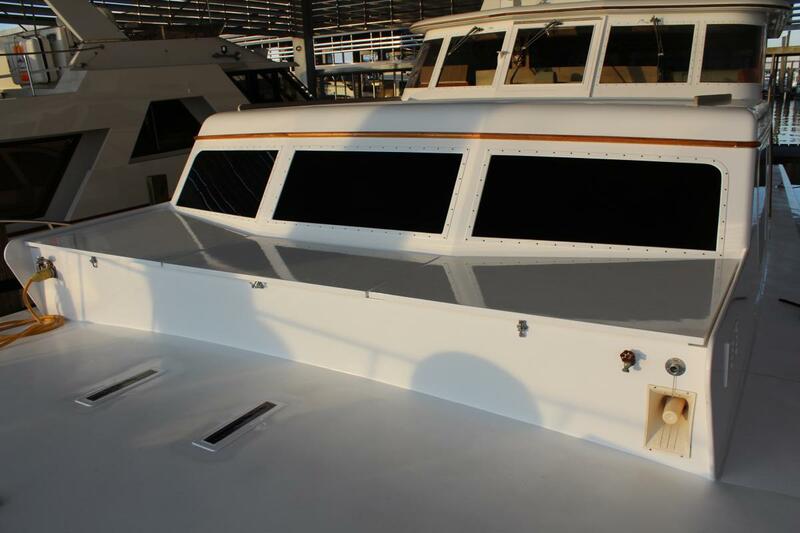 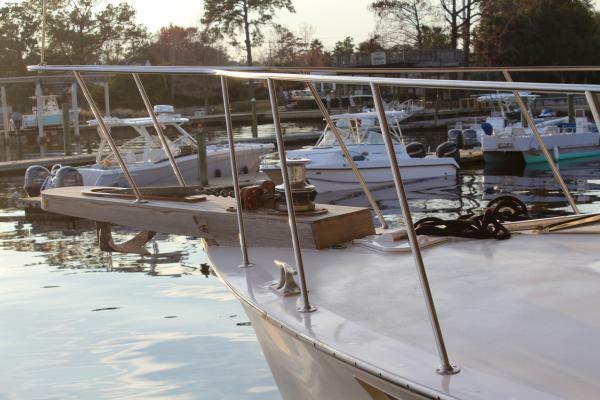 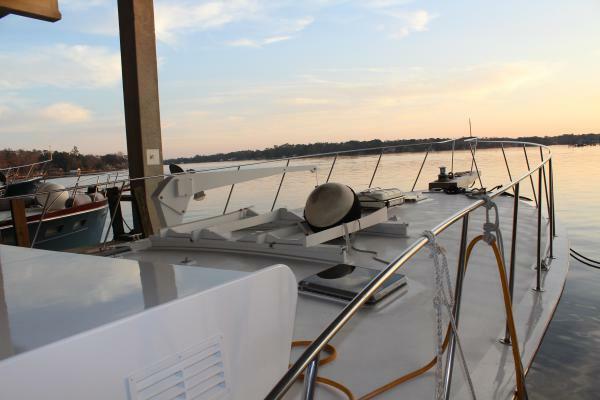 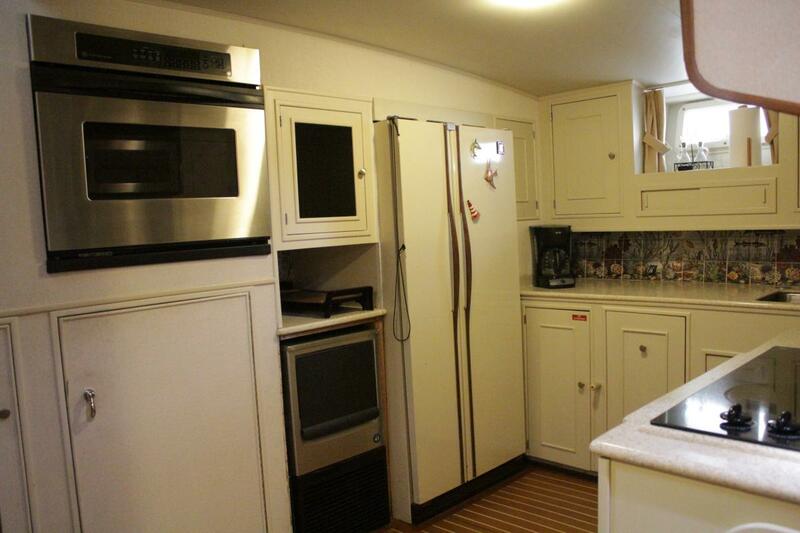 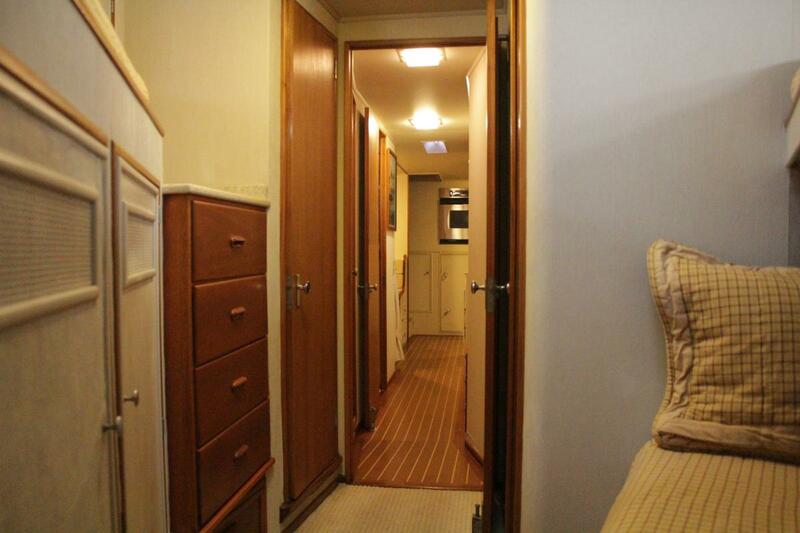 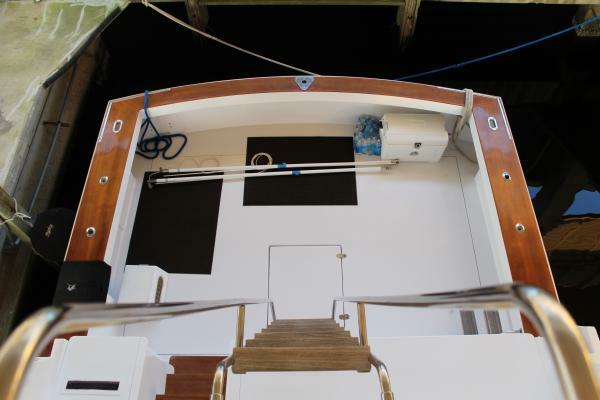 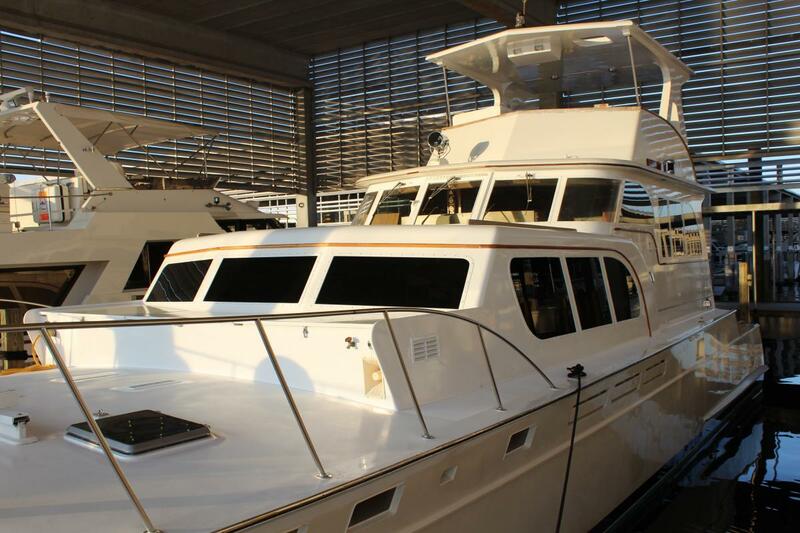 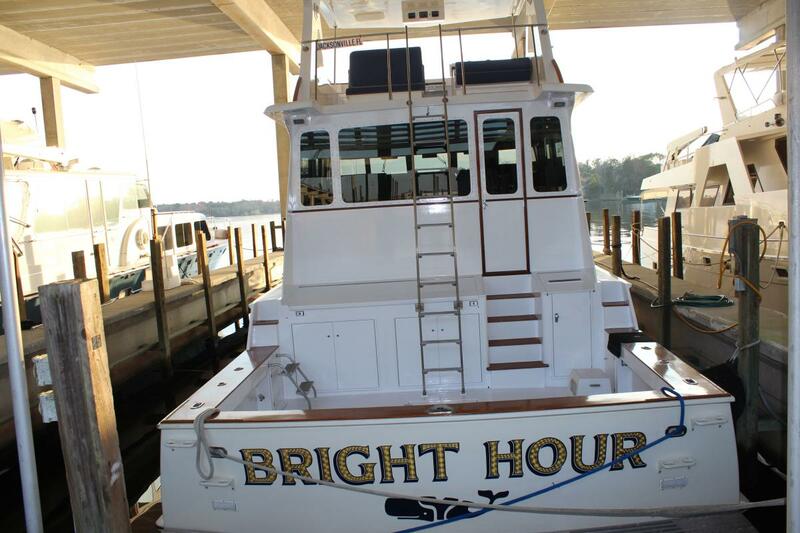 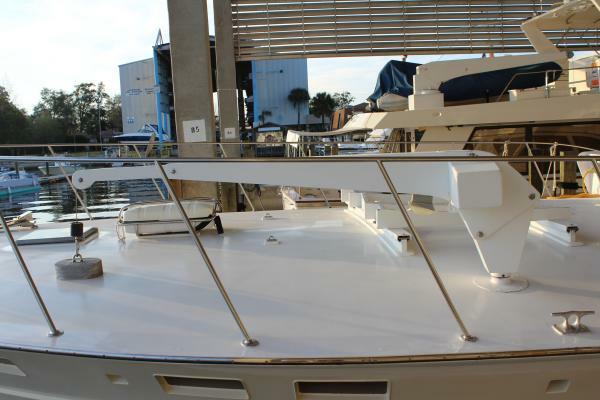 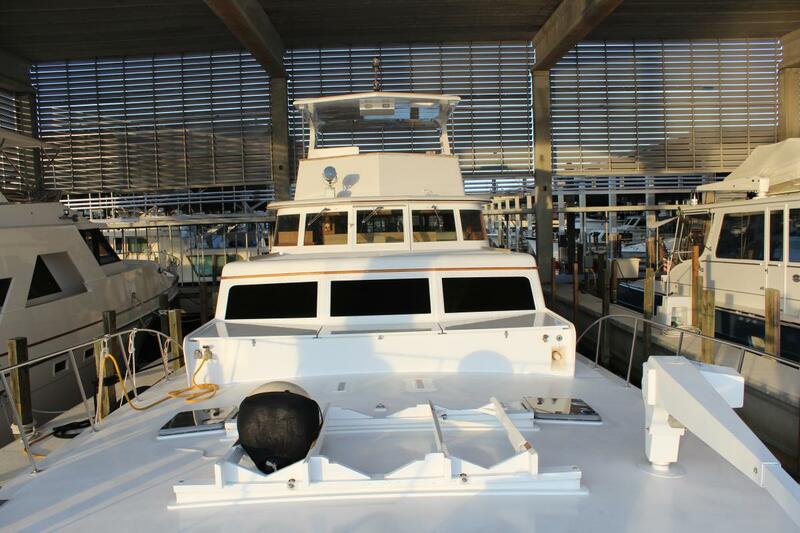 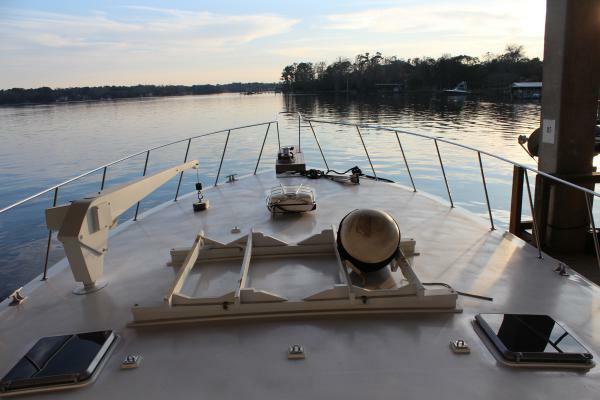 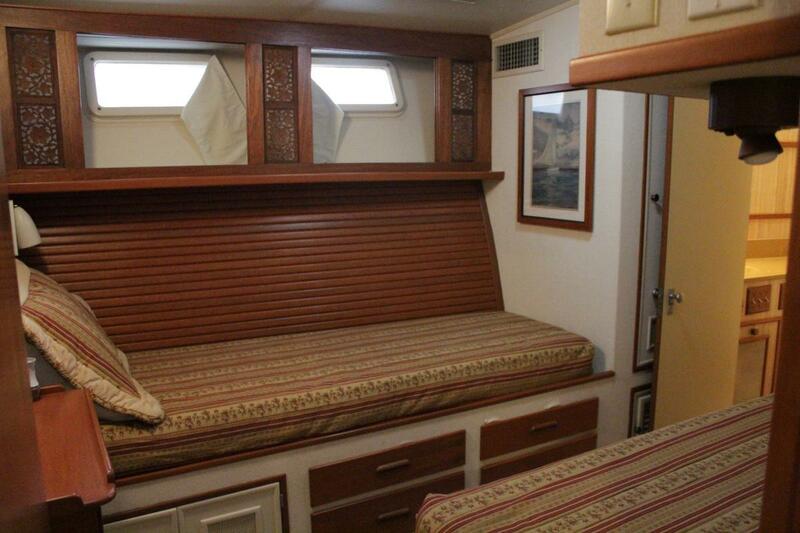 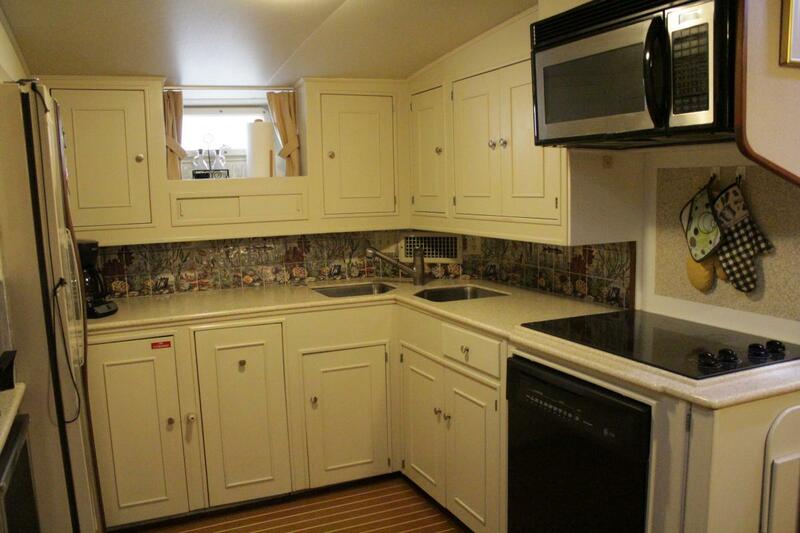 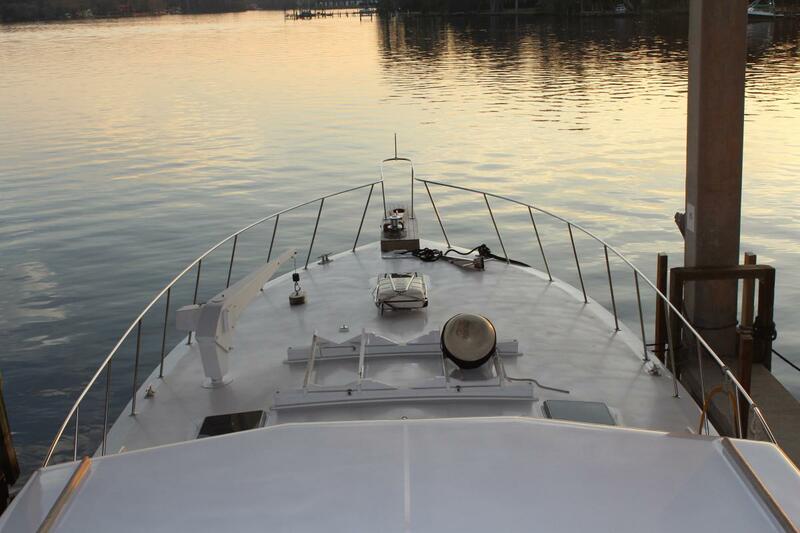 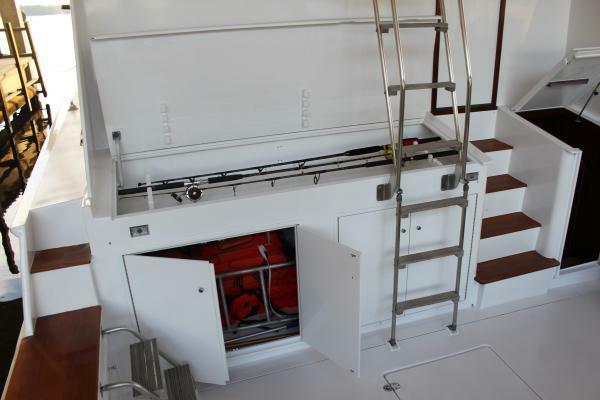 Galley is equipped with a large fridge, microwave, dishwasher, wall oven, 4 burner cooktop and icemaker. 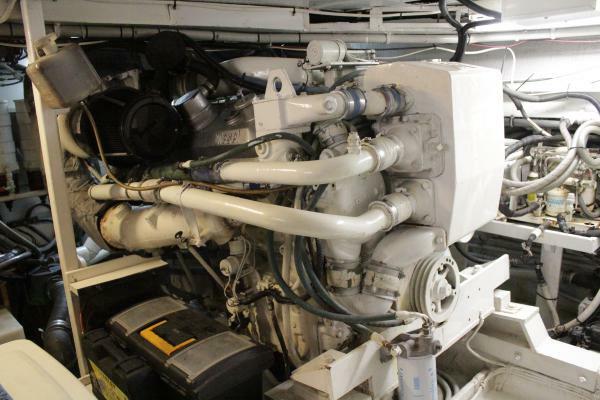 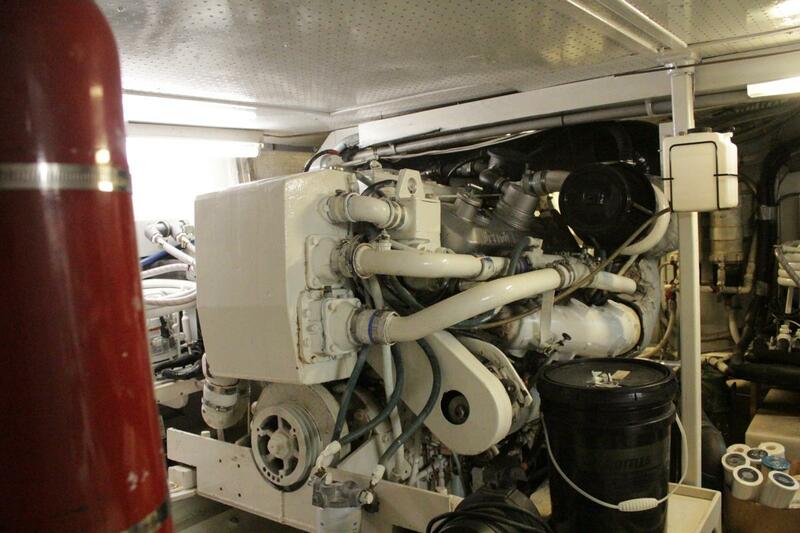 Main engine room access is just off the galley. Up four steps to a large mahogany finished salon with custom raised panel joinery. 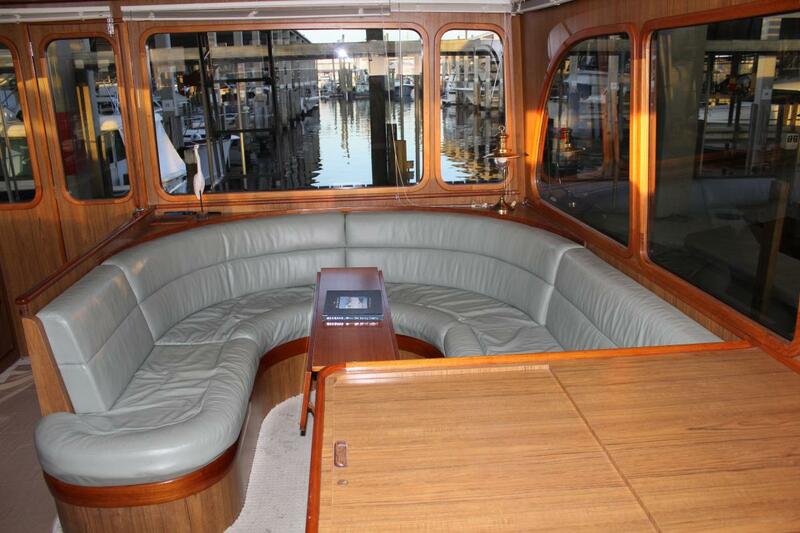 Custom built in L-shaped settee to port will seat 4 comfortably while two others can sit the swivel arm chairs. 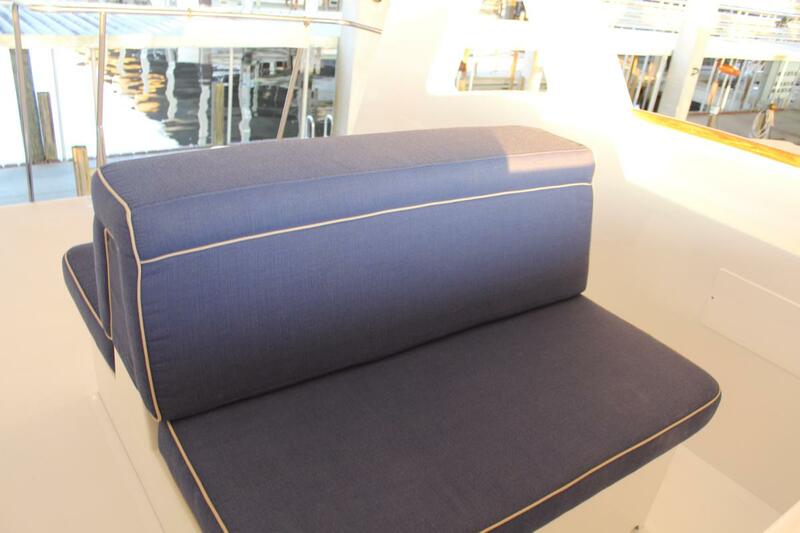 Hi/low table is suitable for dining or cocktails. Wall scones, lamps and overhead lights create the perfect lighting. 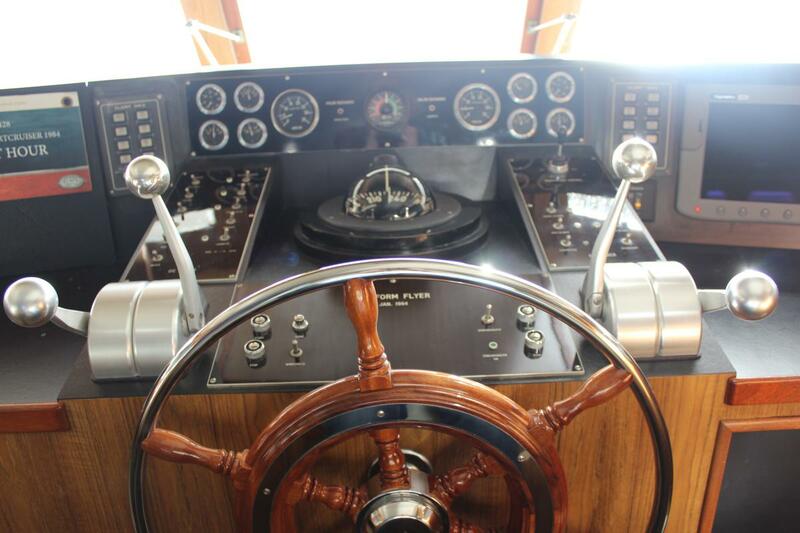 Continuing aft, up three steps to the large pilothouse/bridge deck. 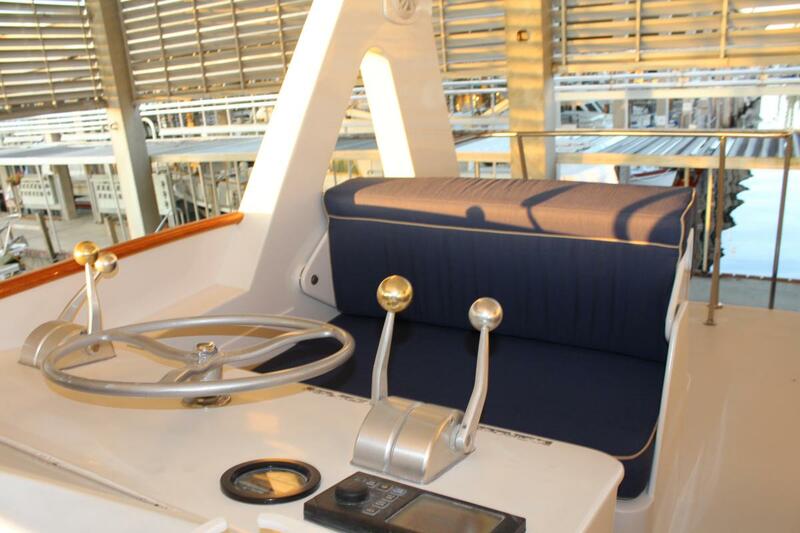 The helm area is forward of both helm chair and companion chair. A large U-shaped settee occupies the aft section of this area. 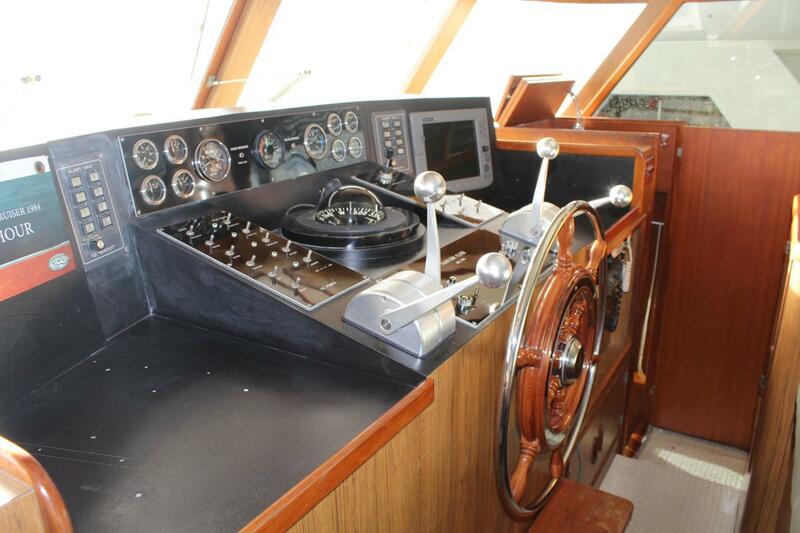 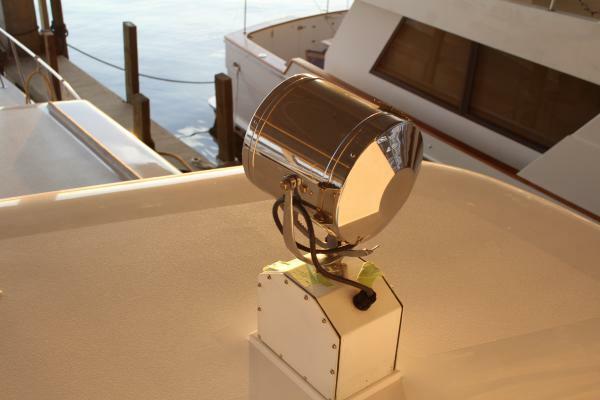 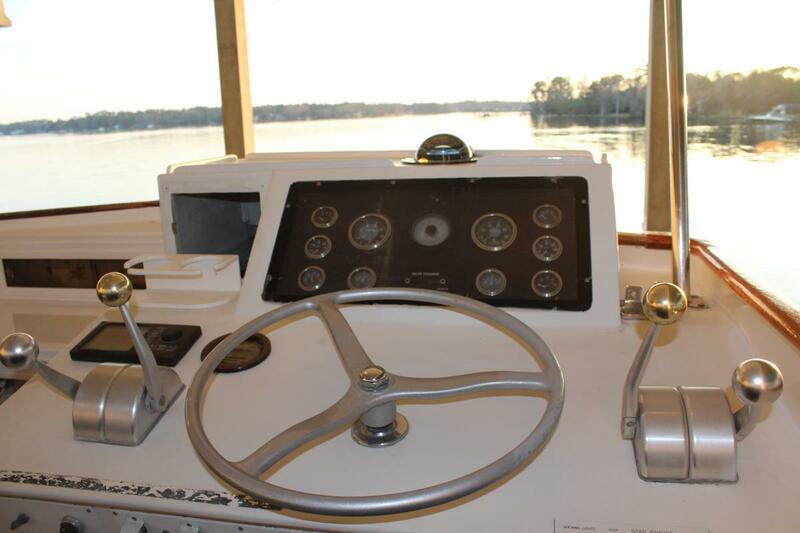 A complete 360-degree view further enhances this delightful inside helm station. with full controls and electronics. 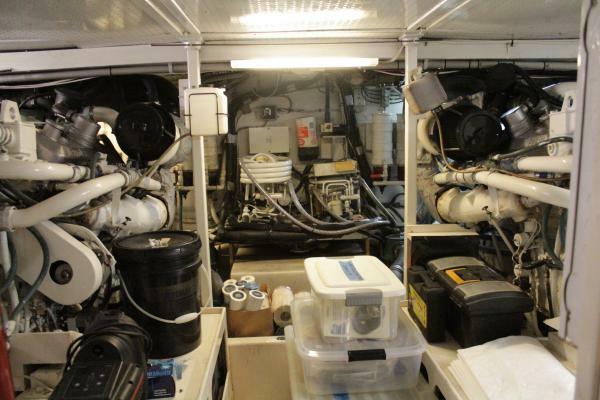 Two generators in the cockpit lazarette. 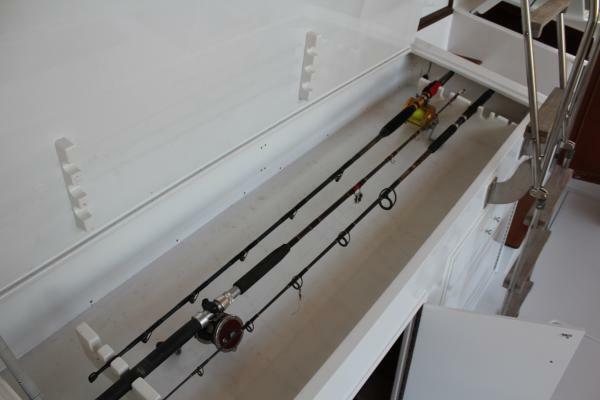 Cockpit is also equipped with tackle and rod lockers. 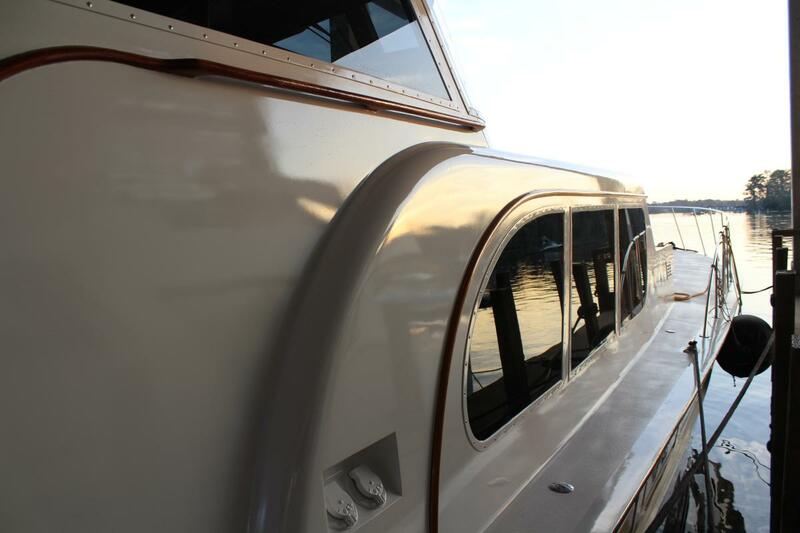 Transom platform.